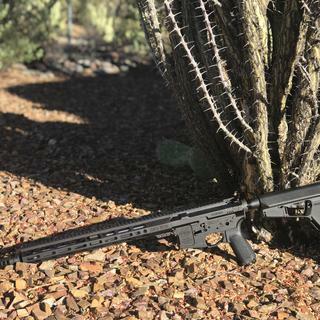 The Patent Pending Dragon is a Muzzle Brake & Compensator designed for 556X45mm / .223 Caliber AR15 style rifles with 1/2-28 UNEF Right Hand threaded muzzles. LANTAC Brakes are CNC machined from the highest quality Military Grade Steel, hardened and then finished using a Tufride QPQ Liquid Nitride process. This creates an extremely tough, high case hardness with the added benefit of increased corrosion resistance. The Dragon brake offers improved compensation over other designs and features a primary discharge chamber with angled, vertical porting to harness gas energy and use it to combat muzzle rise, or flip. Three further open chambers offer a huge surface area for gas to impinge against, thus reducing recoil. The crown patterns gas as it exits the device. In muzzle brakes with longer energy pulses recoil has more of a cumulative effect. The shooter is still managing the energy load from the first shot when the second occurs, as subsequent shots or pulses of energy are delivered they are constantly working to regain position but slowly being pushed further back. While it is possible for an experienced shot to control this situation to a degree, it is by no means ideal. With LANTAC SEP Technology the energy pulse is shortened and it is made possible for the shooter to regain their original position much quicker, subsequent pulses of energy do not overlap as much and therefore muzzle 'recoil' over single and multiple shots is greatly reduced. Sustained full auto fire is possible with much-improved muzzle control meaning that all shots fall on target. is there a Lantac blast mitigation can available for this model? BEST ANSWER: Yes Check YouTube for videos and information Play the attached video above and check out the related follow on video links. Do you make a model for the 6.5 Grendel? The one I got is for 5.56mm but I remember seeing them in 7.62mm also. That might work for your weapon, at least it would clear. Will this work for a .224 valkyrie threaded 1/2x28? Yes, no problem. Just make sure you time it properly. Best 86 Bucks I’ve Ever Spent. 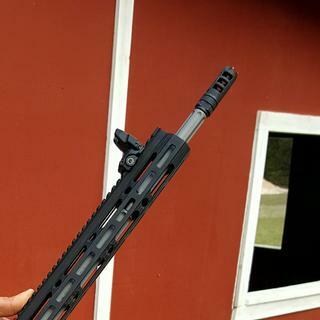 Totally eliminates all muzzle rise and there is virtually zero felt recoil. It’s a bit loud indoors but it’s all bark and no bite. Love it can't be happier!!! Does its job very well. Very little muzzle climb in rapid fire. Good product. Not much in the way of blowback on shooter. Would thread exactly for ports to face 12 o’clock. They sit about 11 o’clock but does not seems to negatively affect use. Best muzzle brake on the market for recoil mitigation by far. Can barely feel the recoil. I was able to one hand an AR pistol easily and still stay on target, and when shouldered, makes shooting a blast. Does sound like a cannon and definitely not a flash hider. But adds to the fun. Reduces muzzle jump and it looks cool. It’s also pretty loud compared to some other muzzle brakes I’ve seen. Works great! Ok price. Took a while to get. For the shooter, it's a treat. For anyone standing around as it is being fired...it's a whipping post! Eliminates all muzzle jump completely. But it is LOUD! I have the Lantac Dragon on all of my rifles. It is by far the best money spent. Felt recoil is reduced to almost nothing without having to mess with springs, adj gas blocks, etc. I would get one of these again! 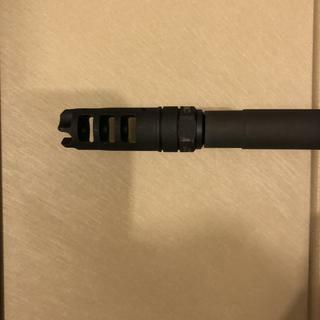 I’m very happy with this muzzle break, I bought this at a great price, you will be satisfied with the performance of the LANTAC Dragon Muzzle Break. Simple customization for your AR. It won't take more than a few rounds to realize why they call this the Dragon. Awesome muzzle flash, great sounding brake, and it performs it's function of keeping the muzzle on the target flawlessly. One quick note; if you're shooting in low light you will absolutely be blinded temporarily by the flash. Works amazing exactly as advertised. Easy to install and makes a big difference when shooting. Should have bought on a long time ago! Muzzle brake is 5 stars Palmetto State Armory customer service is 1 star so average it out at 3. Great deal on a great product. Another home run for PSA. Awesome product! Easy to install with crush washer. I got the timing right on the first try. Excellent recoil reduction. I would recommend to anyone. Easy to install. Can’t wait to send some rounds down range. 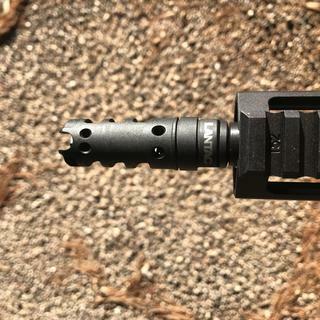 I have 2 of these on different uppers that I run in full auto, on a Colt M16A1 lower, this break actually pushed the front end of the gun down, go to the lantac Dragon youtube and see it in full auto. Best muzzle brake on the market. Double tapping coke cans with irons at 50 yards. Great addition to rifle works very well. Works great, looks great, easy to install. Nice addition to your setup. You won't regret buying it. Great muzzle brake! And at a great price. Put it on my first built. Very pleased. It makes ar like a canon but doesn't move at all and stay on target. I know front sight is backwards, I like this way. Highly recommend. I bought this muzzle break specifically to help my young daughter experience less recoil. It makes it louder but the rifle is so much easier to control. Mitigates recoil by at least 50%-60%. Almost no muzzle climb at all! It makes follow ups and double taps a breeze! It does produce a ton of side concussion, and shoots flames out the side like crazy! Hence the name!! Well made, nice piece! Outstanding muzzle break. It keeps my AR on target during rapid fire, awesome look. Bought this on a whim, price was too good to pass up. First experience with a muzzle brake, and I have to say I'm impressed. Installation was quick and easy, once I finally got around to it. I was able to shoot it side by side with an AR with a standard A2 FH, the difference in recoil and muzzle rise was remarkable, I'd say both were reduced by at least half. I have a scope on the rifle I put this on, it makes it really easy to stay on target during faster strings, and the rifle moves around much less during slow fire. Granted, the .223/5.56 isn't a heavy recoil rifle, but I feel it was a worthwhile addition to my rifle, enough that I'm seriously considering getting one for my other AR. Definitely NOT disappointed! Like less recoil than buy this break. Product is great! PSA price is probably the best you can get. Unfortunately PSA shippied this product without a crush washer. I contacted them about the missing crush washer that is included with the Lantac muzzle break but they replied that they have them for sale if I wanted one. Lantac send me a couple crush washers for free after I contacted them. WOW! Huge difference with the Dragon. I bought this muzzle brake as a daily deal so the price was fantastic compared to its list price on other sites. Package included the brake a crush washer and a small tube of FrogLube. Installed easily with a standard armorer's wrench. I used the Dragon to replace the standard A2 flash hider on my 16" barrel. From the first shot with the Dragon the difference was obvious. Recoil went WAY down and the muzzle climb is now negligible. Much easier to stay on-target with follow-up shots now. The over pressure and muzzle blast for bystanders seems to be increased with the gas porting out to the sides. You might rock some folks at the range with this thing on but who cares. I can't say enough about the Lantac Dragon. Will definitely purchase again in the future.